Everybody wants to end the year with a bang and for Bookmarked, it means our third bookmark collector feature! As you have known for sometime now, bookmarks are collected and the people doing so come from all walks of life, with their unique and fascinating views and stories about this particular hobby. And we here at Bookbed love sharing them with you. We want to showcase as many bookmark collectors and their collections as much as we can! You remember we first featured Willy Nieuwveld from the Netherlands, followed by Liudmila Cernikoviene from Norway. Now, we move away from Europe and head on south, all the way to Australia. And this time, we are featuring a male bookmark collector! Oh, don’t be so surprised. Men do get fascinated about bookmarks, too. Collecting bookmarks knows no gender. Robin Brown is another one of my bookmark exchange partners. He currently has spares for a bookmark exchange so for those of you looking for new bookmarks from the land down under, you may contact him here. Anyway, let’s not dilly-dally any longer. 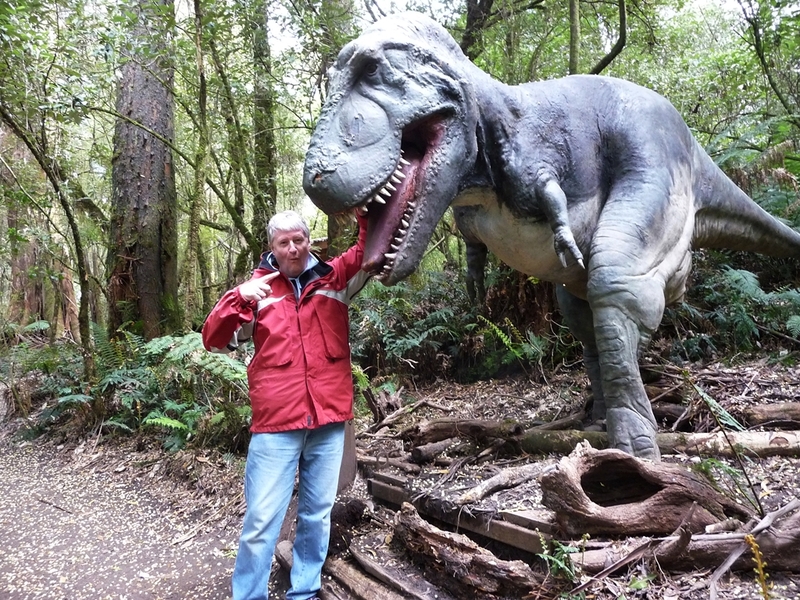 Read on to find out more about Robin and his collection! Hi, Robin! Thank you for responding to our invitation to make this interview and show us your bookmark collection. To begin, please tell us first a little bit about yourself? I soon convince them that simple objects like bookmarks can generate so much fun and intrigue. 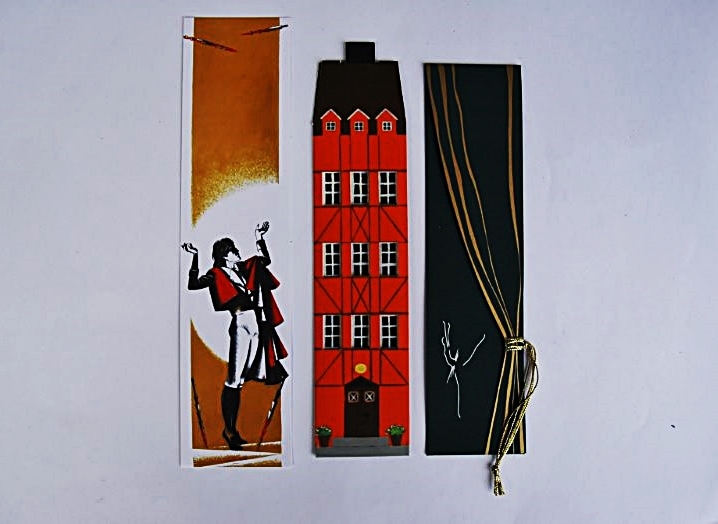 I suppose a collector would say that about any collection, but for me bookmarks are an uplifting inspiration – beautiful, accessible, mostly affordable, easy to store and an endless source of surprises. You never know what will come in next! That was funny! I can totally relate to that. I also get the same reaction more often than not. How do you manage it? People usually look at me with disbelief. Sometimes, they ask me if I am well and pretend to check my temperature! Once they overcome their disbelief and understand that I actually do collect bookmarks, they try to be polite and pretend to think that collecting bookmarks must be normal. When I tell them some bookmarks stories, they usually end up fascinated! Okay, the stories get them fascinated in the end. That’s really nice. Did this hobby of yours start just recently or way back? I started keeping bookmarks as a teenager. I found them simple, funny things, strangely amusing and worth keeping. My formal collecting began in 2010 in one of those moments of grand inspiration! My wife, an avid “window shopper,” spends hours exploring shops without ever buying much. While she fossicks (search) through women’s clothing stores and shoe shops, etc., I wait for her patiently on the pavements outside the shops, feeling totally bored. Then one day, while waiting for my wife, I spotted a stunning bookmark in a shop window next to one of those women’s lingerie shops. I immediately purchased the bookmark and from that moment on decided to spend my wife’s shopping time collecting bookmarks. Admit it, you owe it to your wife. Just kidding! Each bookmark collector has their own reason for collecting. What’s yours? Why do you collect bookmarks? Bookmarks are an important part of our cultural history. They tell stories and are worth collecting and preserving. The seemingly endless varieties of bookmarks are always intriguing. They are fun to collect and one never knows what the next bookmark will be. There’s always an element of anticipation and surprise. They look good, express amazing designs and are interesting expressions of all forms of art. Searching for bookmarks leads me to many unknown paths and experiences and provides a focus when visiting places. It’s also a great way to meet people. I have met so many fascinating people all over the world through bookmarks. Collecting bookmarks is also an affordable interest and they are easily stored. You must have a gazillion bookmarks in your collection, but do you still remember the first one you got? In 1969, I visited a remote village in the Papua New Guinea highlands while preparing to climb Mt. Whilhelm, PNG’s highest mountain. The villagers gave me a superb tapa cloth bookmark which was interesting since books in that part of the world were then quite scarce. This was the first bookmark I collected. Oh wow, that’s priceless! How were you able to expand the collection from your first to what you already have now? From that first bookmark, any [bookmark] I found would find a home in one of my books. When later in life I became an organized collector, I soon learned to access bookmarks from a wide range of sources. These include swapping with fellow collectors, the internet, bookshops, libraries, second hand shops, tourist information centers, markets, antique shops, gift shops, art galleries, museums, garage sales, Trade fairs and merchants, and by enlisting friends and family to collect for me on their travels. I just realized I haven’t asked but exactly (or estimated) how many bookmarks do you have now? I now have 11,000 bookmarks, all catalogued and indexed. Whenever new bookmarks arrive, I immediately catalogue and index them. This is the only way to manage such a large collection. Wow, that is a LOT! You have a very large collection, but we’re pretty sure you have favorites among them. Can you please tell us about some of your favorite bookmarks. I don’t know where to start. I have a fascinating series of bookmarks from St. Petersburg in Russia, another from Spain and Portugal and from many other countries. I am constantly amazed at how each country expresses its own flavor or cultural touch. Each country seems to express a different style in their bookmarks. Overall, my favorite style of bookmark is the artistic ones. The creativity is stunning. Are free bookmarks easy to avail in Australia? Where do you usually find them? Over the time I have been collecting bookmarks in Australia, I have noticed a decline in numbers. Bookshops always have a few free bookmarks. Regional libraries are the best source. They often produce interesting subject series promoting particular themes. These bookmarks are usually well displayed and available to all. What particular kind of bookmarks from Australia do you love or you think is good to showcase to other collectors outside the country? The Australian bookmarks I most enjoy usually come from art galleries. They can be colorful and imaginative. I also like bookmarks of native animals and birds. 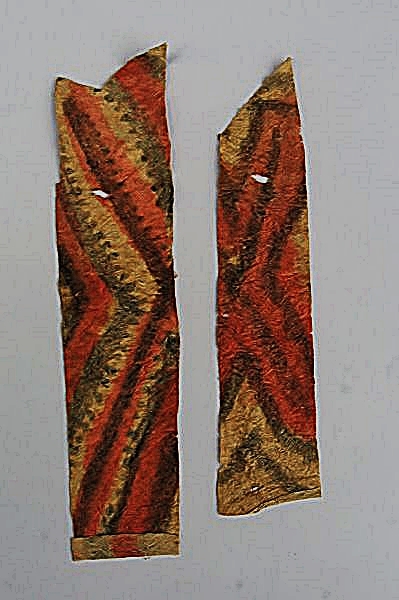 Any bookmark relating to Australian history, people, places and events are always exciting, and aboriginal art bookmarks are usually quite stunning. Is there any particular bookmark theme/kind/material you like to collect more or always prefer when you do bookmark exchanges with other collectors? I started collecting any bookmark I could find. They were made out of paper, cloth, leather, wood, plastic, metal, celluloid, silver, gold, pewter, brass, copper, ivory, aluminum, tin, fiberglass, ribbon and silk. With time I began to narrow down my collection focusing on paper, leather and cloth. I think these materials harmonize better with the paper material of books than do the harder materials. I like most themes but am particularly interested in art, history, people, places, events, literature, music and nature. Antique bookmarks are also exciting but these can be very expensive. We have exchanged bookmarks before, so I know that you do exchange with other collectors. But where do you meet the bookmark collectors you made exchanges with? I have been privileged to exchange with many people all over the world. I found the Mirage bookmark website particularly helpful in sourcing fellow collectors. Collectors are listed by country and many are eager to swap bookmarks. One of my goals is to have a selection of bookmarks from every country in the world. We’ve talked about acquiring bookmarks, now let’s move on to storing them. How do you store such a big collection? All my bookmarks are placed in plastic wallets, three bookmarks in each wallet sheet. I use a soldering iron to divide each plastic wallet into three sections. Each bookmark is allocated a number which correlates with a catalogue description recording the date purchased, place of purchase, cost if any, details of condition, subject, material and description. The plastic wallets are then placed in a large lever arch file. 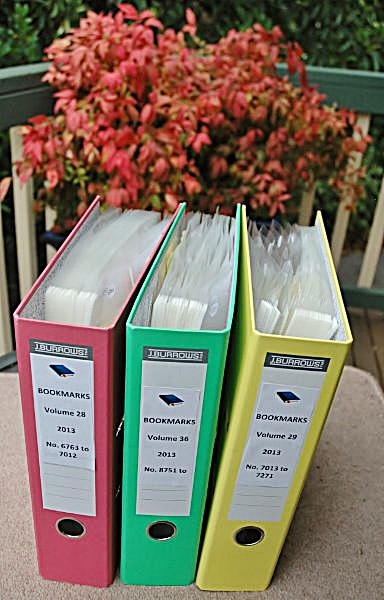 Each file is labelled by volume and contain 250 bookmarks. 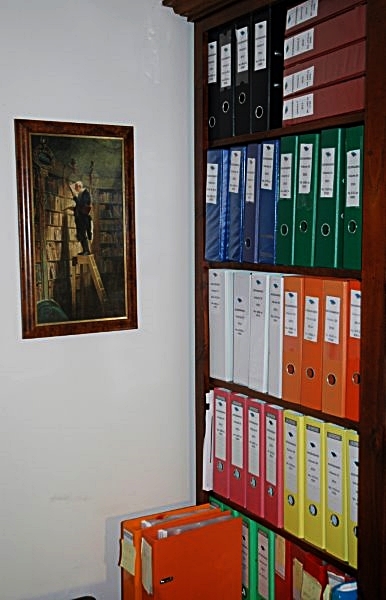 The plastic folders are stored on book shelves. Each volume can be easily accessed and opened. I believe, like me—or every bookmark collector for that matter—you love every single bookmark you have in your collection. You don’t want to ruin or lose them. So we wonder if you use one from your collection? Yes, I always use a bookmark from my collection when reading a hard copy book. I usually select a bookmark from my store of spares. I have many spares that I keep for swaps. The spares, of course! Thank goodness for them. Do you think bookmarks have any other value aside from marking your page? I think bookmarks have enormous historical and cultural value as items of biblio history. They provide irreplaceable information about aspects of our historical and cultural interests, both past and present, and they add to the body of knowledge about our lives. They are also reveal aspect of the charm and character of various cultures and are sometimes works of art in themselves. They are an art form and unique medium for creative expression. They can also be a useful tool in communicating and promoting issues, events, people, places, objects, products and stores. Very well said! Do you have other hobbies aside from collecting bookmarks? I try not to collect other objects. I have a small collection of Chinese snuff bottles and that’s about it. I am a true bibliophile and love reading and studying. When I have time I work in many different creative projects and particularly enjoy history, the social sciences and fine art. At the moment I am reviewing the work of Joseph Campbell and exploring ways of communicating his profound wisdom in mythology to younger generations. I also love the outdoors and spend as much time as possible bush walking. Like in everything we pursue in life, we also experience difficulties in collecting bookmarks. Would you like to share the difficulties you’ve experienced in collecting bookmarks? Some of the most beautiful bookmarks are expensive. I am often tempted to purchase these for other collectors but am constantly challenged by the prices. I really enjoy antique bookmarks but again these are often less accessible because of the high prices. Sometimes when one swaps bookmarks you send yours but their swap never arrives, always disappointing. Having mentioned the not-so-nice side of it, do you have some words of encouragement for the other collectors? Enjoy, enjoy and enjoy! Engage in swapping with other collectors. This helps to keep your interest fresh and you will always enjoy the anticipation of the next surprise to arrive in your mail box. You already mentioned that you’re a true bibliophile, so now we’re curious, what do you read? About every three months, I immerse myself in a reading subject. Early this year, I read Mesopotamian history, then the British monarchies, now Joseph Campbell mythology, etc. Most of my reading is nonfiction. Wow! That is something! We hate to end this interview so quickly, but we know you still have things you need to attend to. But before we close the interview, any concluding words from a bookmark collector? What can we do to promote bookmark collecting among the younger generations? As the social media age explodes, it is likely that younger generations will grow up in less book-oriented environments. This means they will be exposed to fewer bookmarks of the non-electronic kind. Finally, I would love to hear from anyone who would like to swap paper bookmarks! You may email me here. I am smitten. These are all so lovely and what a wonderful idea it is to collect bookmarks in this way. Thank you for sharing these, Robin. Thank you for reading, Steph! 🙂 If you have a bookmark collection as well, you’re welcome to share it with us!